(09-17-2016 08:53 AM)OldOwl Wrote: Why did they have Biden speaking during a home football game? I call this poor management by the University. (09-16-2016 11:43 PM)Tiki Owl Wrote: As for the stadium improvements the athletic folks busted their butts this week. The Biden speech really impacted not only the VB tourney, but also the activities of marketing and others. They did a good job pre-selling parking as by Thursday all West spaces had been sold. Biden's remarks were in the afternoon, ended by 4:30 or so. I don't think it had much impact on football though VB is a different story. I don't know when the offer came to host the Vice President but it was one we couldn't turn down. Given our connection to the TMC and it's institutions and our own research it was natural for him to speak at Rice. Not to mention the connection with the name of the project being Moonshot. The problems for the staff I mentioned was basically in the days before the speech/game as getting Tudor set up, security, and planning impacted their work. However, in spite of extra meetings and such they pulled off a great game day experience as well as helping make the Biden visit first class. The Vice President's schedule is pretty well set and I find it funny that you think the University could change it...or perhaps you would have preferred the University to say no and suggest Biden speak at UH? The football game got plenty of national attention but having the Vice President speak AND the football game got even more and a good many news reports tied it back to the JFK moon speech. OK, I will steip off my soapbox. My favorite tweet was "The MOB investigated the scandal more than Baylor ever did". (09-17-2016 06:27 AM)Mademen Wrote: Props to the MOB. Michael Corleone quality beat down. BTW anyone else think Jim Grobe is basically Bailiff with better talent right now? Baylor has looked terrible all 3 games this year. Totally agree. I think his job is to stand on the sideline "looking" like the HC until Baylor thinks its safe enough to name Kendall as the new HC. Kendall looked more "professional" last night after ditching his usual stupid hat. He also had that HC look with the arms crossed and very studious look on his face. I thought Kendall might be on our short list later this year. I guess we can scratch that. (09-17-2016 08:58 AM)Da.Owl Wrote: Google news app promotes USA Today article on MOB as one of its headlines. Chronicle front page: "Rice's MOB makes a statement at half, page C1"
(09-17-2016 07:03 AM)Barrett Wrote: MOB still needs to grow its numbers. I have no idea how, but the numbers still seem so anemic to me. But I agree that the script was good. The new band hall should help with the numbers - a lot. It is a wonderful rehearsal venue. We can hear what we're playing. It is also fantastic to walk up the tunnel, turn left, and be there, after the game. A show like this won't hurt recruiting and retention either. But how often are we handed material like this? Glad to hear the Cox facility is working out for the MOB. Kudos to the athletic department for listening to the MOB and coming through with the needed facility. BTW Grungy how about some pix of the new band hall. Deadspin is covering it. Some comments are excellent. (09-17-2016 11:06 AM)Tiki Owl Wrote: BTW Grungy how about some pix of the new band hall. We're still moving stuff from the gym, so it's still fairly cluttered with boxes and things that haven't been put away. We weren't expecting to take occupancy until 1 October. (09-17-2016 12:09 PM)Grungy Wrote: We weren't expecting to take occupancy until 1 October. We're very grateful for the generous space. That said, any renovations have to be paid out of our miniscule budget -- and most of what's available has already been spent improving the acoustics. 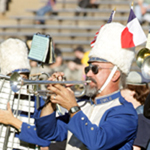 So if you want to show support, or need a bigger tax deduction, do consider directing a gift to Rice Bands. Any little bit is appreciated and will be put to good use. I hope you will post script online, complete with Jumbotron graphics. You have to do it quickly, though, so you can generate another "hits" histogram (pre/post Todd Graham show). (09-17-2016 12:30 PM)HooCares Wrote: I hope you will post script online, complete with Jumbotron graphics. You have to do it quickly, though, so you can generate another "hits" histogram (pre/post Todd Graham show). Server is offline, unfortunately, until Rice Networking drops new lines to our new place. Graphics posted to the MOB's public Facebook page, however. Wow. Actually, that sort of pisses me off. Let's get real. Baylor fans were offended that someone made fun of their school. Period. If it was truly the topic, why did they give Briles a standing "O" last night? They aren't sorry, just sorry they got caught. I can't believe Rice responded, officially, to this faux outrage. It's the last half of the last sentence that makes me sigh. The rest of it was fine. Quote: Sexual assault is a matter of serious concern on campuses across the nation, and all of us have an obligation to address the matter with all the tools at our disposal.